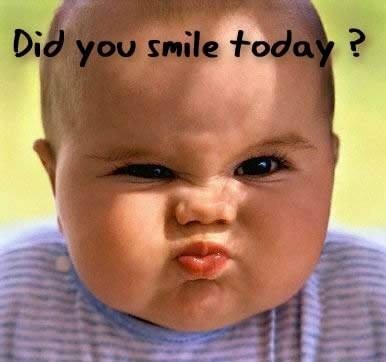 While doing some random internet searches I came across many interesting facts on a simple thing called smile. Here I have clubbed some of those to share with you. I do give credit to the various health related online portals for enlightening me a little. When we smile the body’s immune function improves as you are more relaxed. This prevents common colds and flu. So keep smiling! Smiling prevents us from looking tired and worn down. Laughter reduces the level of stress hormones like cortisol, epinephrine, dopamine and growth hormone but increases the level of health enhancing hormones like endorphins and neurotransmitters. Smile and laughter increases the number of antibody-producing cells and enhances the effectiveness of T-cells. So when you feel stressed try flashing your beautiful smile! Smile helps in reducing your blood pressure. It relieves physical tension and stress leaving your muscles relaxed. So all you victims of High Blood Pressure try smiling more! Smiling releases endorphins, natural pain killers, and serotonin. Together these three are our feel-good chemicals. Endorphins promote an overall sense of well-being and can even temporarily relieve pain. Thus smiling is your natural drug. Smile and laughter improves the function of blood vessels and increases blood flow, which can help protect you against a heart attack and other cardiovascular problems. A little laugh will benefit you. See, even if life gets complicated a little thing is sufficient to bring you out of that. Try smiling to your regular grocery guy, or the ticket collector, or the security guard in your office, you will not only make them a little surprised but also help your health. And who knows we may be able to bring a smile on some one’s face who might have never seen the happier side of life. Flash your beautiful smiles! A beam of your sunshine you can spread across miles. Because smile is a gift which costs nothing!